It is with great enthusiasm that I begin what is planned as a monthly column regarding Liberty Seated Quarter die varieties. The intent is to offer a brief description, some photographs, and a few facts, opinions or stories regarding the monthly coin-of-interest. There are, literally, hundreds of coins to choose from. 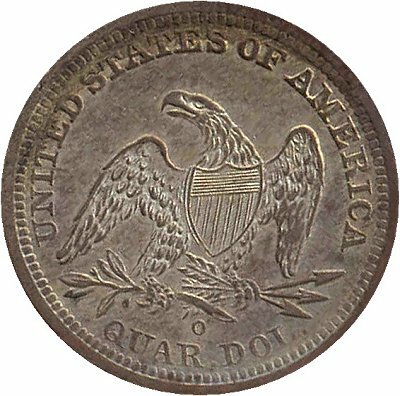 Seated quarter varieties cover the spectrum from merely scarce to excessively rare, from obscure to listed-in-the-red-book, and from immediately obvious to very subtle. It is an intriguing and nearly endless area for numismatic study. The first Quarter of the Month is a rather obscure, rare, and very interesting die pairing of the 1843-O. The feature one immediately notices about this coin is the extremely polished reverse die (listed as reverse E in Briggs’ The Complete Encyclopedia of United States Liberty Seated Quarters). Note in the picture above the complete lack of tail feathers and the missing feathers at the top of the eagle’s left wing. The first example I located, several years ago, was a rather harshly cleaned example with uncirculated details. Its initial appearance was so striking that I thought it was counterfeit; it didn’t look like a seated quarter reverse at first glance. After determining that it was indeed genuine, I considered purchasing the coin despite the significant problem. The asking price persuaded me to pass. Over the past 3-4 years, while diligently working on a die marriage set of ’43-O quarters, I have located no more than six examples of this particular die pairing. Interestingly, all six examples have had XF or better details. This reverse die is easily identifiable, not only by the die polishing, but also because of the unique mintmark position. There are six known reverse dies for the ’43-O quarter – five small O and one large O. Amongst the five small O reverses, one has the mintmark just right of the crotch between feathers and olive branch, one is centered, two are very slightly left, and the present reverse die (E) is the only one located completely to the left of the crotch. The other four small O reverses all pair with Briggs’ obverse 1, reverse E pairs with Briggs’ obverse die 2 and is the only reverse known to be paired with that obverse die. The distinctions between obverses 1 and 2 are subtle and will not be considered here. Though the sample size is very small (six pieces) it also appears that, like many coins from highly polished dies, this reverse generally comes proof-like in appearance. The 1843-O quarter, as a date and mintmark, is a very scarce coin in high grade or problem free condition. In addition to the usual problems such as harsh cleanings and holes with which early seated coins are frequently found, the ’43-O is also plagued with poor strikes, heavily rusted dies, and poor quality planchets. It is interesting to note that reverse E, discussed and pictured here, does not appear to have been used prior to being heavily polished. The unique mintmark location would make attribution of such an early, pre-polishing, die state fairly straightforward. One can speculate that since dies were made in Philadelphia and shipped to New Orleans, this particular die most likely rusted quite heavily prior to its first use in the coining process and was therefore polished prior to that initial use.